In the beginning of selling Avon I was having trouble trying to figure out who to give an Avon Brochure during the Avon Campaigns. It was like they were valuable and a scare resource. I would order ten at a time and very carefully give them away. I went to an Avon meeting. My DSM was giving us Avon books. I was greedy and took a box. One of the ladies from my upline asked me what I planned to do with all those Avon Brochures. After my being surprised by the question, she started to talk to me about how my brochures were my store. I realized that if the Avon Brochures were my store I needed to get them out there so people could shop! The Avon brochure is valuable but it is most valuable when given away. I am now at the point I order 70 Avon Brochures each Avon Campaign. If someone needs two so she can give one to a friend it is no problem. I hand them out freely in all kinds of places. It works. Sign up at www.startavon.com . Use reference code mylindaelliott . Pay the $15.00. 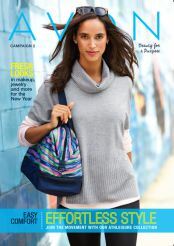 You will then be signed up as a new Avon Representative with an online account and website.